We will counsel, as to content, all individuals and companies who are involved in plans and contracts of construction. Aside from the building contract, of great importance are regulations regarding public law, possible construction permits, distances of areas, regulations regarding appropriate discharging of materials and communication with the appropriate public offices. Central to the private building law is the contract to produce specific work, this encompasses comprehensive projects such as commercial buildings, industry and warehouse halls with their complex performance requirements and their complex contractual obligations between the parties as well as the building of single-family homes. Participants here can be builders, architects, statistical engineers, structural engineer, engineers, and craftsmen. We will also supervise and settle for you the contractual relationships with subcontractors who often will become involved. Furthermore, the subject of building costs and possible fines for contract infractions due to delay in construction, which are a common occurrence in this field, have to be addressed with care. The cost of building has to be carefully calculated in anticipation of possible surprises, taking into account conditions of the ground, contamination of soil or unanticipated wishes of the builder etc. Center of the architect law most often is the architectural contract, whereby the architect’s fee will have the HOAI (Honorarordnung fuer Architekte und Ingenieure/Fee scale for architects and engineers) will serve as a guideline. Since the architect is responsible for the planning and any possible resulting mistakes, even if only discovered years after approval of the structure, the discovery of what led to the resulting mistakes will often become a point of contention. Here, good consultation becomes essential. With us you will have experienced specialist in these law areas on your side, specialists who continually keep their knowledge in the regulatory areas of private rights as outlined by BGB and VOB (Vergabe- und Vertragsordnung fuer Bauleistungen/Distribution and contracts regulations for building requirements) strengthened and updated by regularly attending seminars and of course due to the sheer amount of cases we handle. We have many fee-based cases since this model has proved itself to be the most advantageous for our clients, who in this way, can count on our consultation from the planning stage until completion of their project. We will counsel you in all areas of traffic laws and ordinance infractions. Our advice will cover everything in the areas of traffic accidents, law infractions and questions regarding traffic in general. For instance, we will help you when you have received a traffic ticket or if because of an accident your driver’s license has been suspended. Many times it will be possible to expunge the fine or have it lowered. Furthermore, there are numerous possibilities to have the suspension of the license lifted or at least have the suspension considerably shortened. We can also help you with accidents that occurred in other countries or when an MPU (medizinisch-psychologische Untersuchung/psychological medical evaluation) has been ordered. We will be at your side with competent advice when dealing with questions of liability and laws affecting automobile transaction. For the most part this is an area of civil law dealing especially with damages, law of obligation and property laws, however exceptions traffic regulations apply. In the area of traffic law, we have much experience and put great emphasis on this area of our expertise. This is why we employ experts in this area who will work for you to bring these cases to a quick and satisfactory solution for you. Here, communication with insurance companies is often central. Regardless whether automobile insurance, collision insurance or insurance of persons, we can counsel you in a comprehensive and satisfactory way. In this area especially, you will find that consultation with us and our help will save you cost and minimize your effort. In the area of regulatory infractions, infractions in all areas are covered by us. Be it traffic tickets or infractions having been committed within your company, we will be at your side with competence and experience. In this area you can find an abundance of regulations, e.g. regulations from the BGB (Buergerliches Gesetzbuch/ Civil Law), StVG (Strassenverkehrsgesetz/Traffic Law), StVO (Strassenverkehrsordnung/Traffic Regulations, the OwiG (Ordnungswidrigkeitsgesetz/Law of Regulatory Infractions) and of course possibly the StGB (Strafgesetzbuch/Penal Codes). In addition to this, many times insurance regulations must be taken into consideration. Of course, we will be handling all proceedings and law suits for you. Our attorney Simoncic is a recognized specialist in the field of traffic and insurance laws and continuously updates and refreshes his vast knowledge to stay current in this area. This is why we can support you with comprehensive and reliable consultation. The insurance law covers the connections of the risk community, meaning the insurance company’s clients and the insurance company. The insurer manages the claims of the clients. The insurance law covers a wide field of different insurances. We counsel you in various areas. For instance, in the area of liability insurance (especially mandatory insurance, private, company liability and insurances for independent professionals, insurance for the construction industry, product liability insurance) we will minimize your issues and take over communication with the insurance companies. Especially in the automobile area liability and collision insurances often play an important role, regardless which side of the insured party you represent. Your collision insurance is your automobile insurance that is in the group of property insurance. Into this group also belong home owners, fire, break-in and travel luggage insurances. We are also proficient in the areas of transport and trucking insurances. The law of insurance of persons, especially health, life and accident insurances, workers compensation, and travel insurance is within our area of expertise. Of course we are also very knowledgeable in the areas of legal defense insurance and will help you to follow through on your claims and to bring all of your other cases with your legal defense insurance to conclusion. Our attorney Simoncic is a recognized specialist in the field of insurance law. This means that our firm handles a very high number of insurance law cases and that continuous education in this area assures that we can always be current on its jurisdiction and are able to counsel you. Civil law or private law is the area that deals with interactions between people. For the most part it consists of contractual relationships but also addresses questions of law that arise in the framework of accidents or general damage. 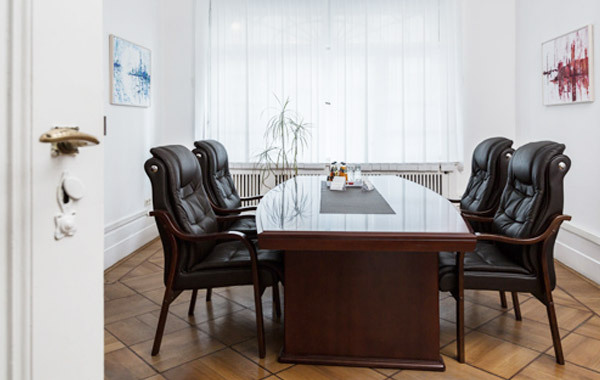 Aside from consultation and representation in the areas of contractual and indemnity law we are especially versed in the area of national and international inheritance and labor laws. Inheritance law is a complex area. Especially when dealing with other countries, e.g. when persons within the group of those sharing in the inheritance live in different countries or inheritance items such as land are located in other countries, the legal aspects can quickly become hard to sort out for the layman and the issuance of a certificate of inheritance and other documents can be difficult. Thanks to our vast experience we can help you with this and can represent your interest with confidence and achieve results. We are also quite experienced in processing company shares that are part of an inheritance, such as stocks or certificates of insurance and can, in most cases, ensure a speedy and satisfactory conclusion. Even in the case of a law suit, we will enforce your claims in and out of court with confidence and expedience. Civil Law/Traffic – Please read our remarks in the area of traffic law. In the area of employment rights, we can again serve you with vast experience and have specialized colleagues who will attend to your case. We have several companies as clients but also represent employee’s interests. The civil procedure law deals with the process, meaning the hearing of your case in court. There are often many ways to get to your goal. We are ever mindful to find the most advantageous, promising and speediest way. Aside from a resolution by verdict, it is often possible via compromise to come to an agreement out of court or to an agreement within the framework of mediation. We will find the way that is best for you by prioritizing your interests. In case you have been indicted or accused, we will represent you. Furthermore we will preemptively counsel you which often prevents an indictment. Even when sentencing seems imminent, there often will be tools and ways to eliminate or reduce the punishment. It is of importance here to find the way that is best for you and inasmuch as possible to prevent an entry in the Federal Central Criminal Register even the recording of prior convictions. Even after sentencing has taken place, it is often possible to minimize the time and negotiate the terms and length of probation. Good consultation will be advantageous at any time during your process and is highly recommended. In the area of criminal law we have a highly qualified staff with much experience who will, in the greatest of confidence, serve your interests.